Current Issues • HealthCoping with Mud Fever this winter. Coping with Mud Fever this winter. I’m sure many of you dread the thick mud which comes along in winter. Both you and your horse get splattered, all outside jobs become more of a challenge and if you are like me, you obsess over the possible onset of mud fever. Our fields were terrible last year, I was lucky and Scottie only got the tiniest bit of mud fever but it still managed to take over my life! Although we associate mud fever with the cold wet mud of winter, a horse can get it at any time of year. It is caused by a bacteria (Dermatophilus congolensis) which is found in soil all over the UK. When the skin is damaged or soft from exposure to mud/water,the bacteria is able to enter the skin and cause the condition know as Mud Fever. Mud fever is recognisable by the infected sores often found on the lower leg. These sores can spread up the leg and can become very painful. With more serious cases there is often swelling in the infected limbs and can cause lameness in extreme cases. How to deal with muddy legs? One of the most popular solutions for muddy legs is to just leave them. Once the mud has dried, you simply brush it off. However, some horses need protective boots for exercise which shouldn’t be worn over mud and if you are like me, you don’t always have enough hours in the day to allow your horses legs to dry and to brush the mud off before riding. Also, if your horse is particularly injury prone in the field, having muddy legs can hide new injuries. Another popular option is to hose the legs off. This method is great if you do it properly, doing it wrong can increase the chance of getting mud fever. If you’re going to wash the mud off, you have to get all the mud off and dry the legs off. With Scottie I use a mixture of towels and stable boots/wraps to dry his legs quickly and keep them warm. You could also try stopping them getting muddy in the first place. Of course, you could do this by not turning them out at all, but this isn’t a brilliant solution! I have a pair of premier equine turnout boots which are great as long as it isn’t deep mud. These offer supportive protection in the field as well as keep the leg clean and dry. This year I am also going to try putting baby oil on clean legs as this helps to stop mud sticking to the legs and makes it easier to brush off once dry. However, you still need to wash the baby oil off every few days and reapply. Despite what many people say, you do need to remove the scabs and wash with an antibacterial/antiseptic scrub. I like to use Hibi Scrub. If you do not remove the scabs, the treatment you are using will not be able to reach the bacteria. Depending how sensitive your horse is, you may need to be careful about how you remove the scabs. Depending on the horse and how bad the scabs are, washing the legs with warm water and a little bit of Hibi scrub might be enough to soften the scabs to that you can remove them. You can then apply a little more Hibi scrub to the area before rinsing and drying thoroughly. Another method is to apply a generous amount of baby oil to the scabs and then wrap in clingfilm. Then bandage or put boots over the top to keep it all in place and leave for a few hours or over night. By the morning the scabs should be nice and soft and should come away easily. Before attempting this, test patch to make sure the horse is not allergic to baby oil and be careful not to clingfilm or bandage too tight. Barrier creams are also useful to have. However, you have to be careful about how you use it. This is because they do not only keep new bacteria out, but they also keep current bacteria in. I use barrier cream when I have removed the scabs and thoroughly cleaned the area. Once the leg is dry, I apply a little cream to prevent more bacteria entering. 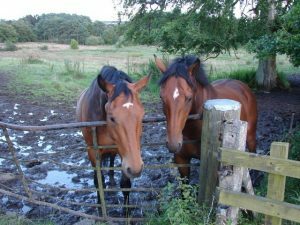 Does your horse suffer from mud fever? How do you cope with it over winter?